Note: This is the first in what will be a series of essays about South Peoria's history, development, and present conditions. These essays may be updated as my research becomes more complete. All essays are linked to an index page for easier browsing. Project homepage. South Peoria was developed as a streetcar neighborhood, building out along the Lincoln and Garden lines. 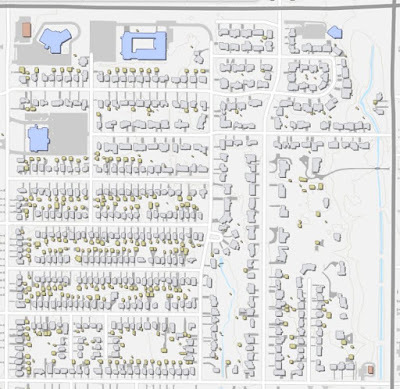 We'll take a look at the general characteristics of Midwestern streetcar suburbs (or neighborhoods), and we'll compare a typical Peoria streetcar neighborhood (South Peoria) to a typical postwar neighborhood in central Peoria and a typical suburban-style subdivision in far north Peoria. Streetcars work exceedingly well in the flat topography of the Midwest (significant hills require cable cars, like San Francisco's), and in many Midwestern cities became the primary mode of transportation for people of all classes. One of the most characteristic features of streetcar neighborhoods is small commercial establishments on corners where cross streets cross the streetcar's street. These are typically flush or nearly flush with the sidewalk, and if there is any parking, it's behind the building. These commercial buildings were often originally built with the idea that the proprietor would live above or behind the shop. The most typical uses were small mom & pop groceries, where you could pick up a few items on the way home, and neighborhood taverns. Let's look at a couple of characteristic Peoria neighborhoods. This is part of the South Peoria neighborhood that I've been documenting. Grey buildings are housing; yellow are outbuildings (mostly garages); red buildings are commercial; and blue are non-profit (mostly schools and churches). You can see the mix of red commercial buildings in the primarily residential neighborhoods, as well as a smattering of small churches and larger school buildings. South Peoria: Residential with "corner stores" and many churches. In this map, I've traced in red a major 4-lane arterial road, Western Avenue, that marks the neighborhood boundary and features larger commercial establishments. 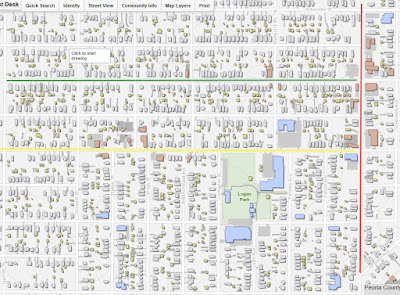 In green, Garden Street, which had one of the two neighborhood streetcar routes; you can see the small red commercial buildings -- former corner stores, taverns, small garages -- studding the streetcar's route and providing services to the houses along there. 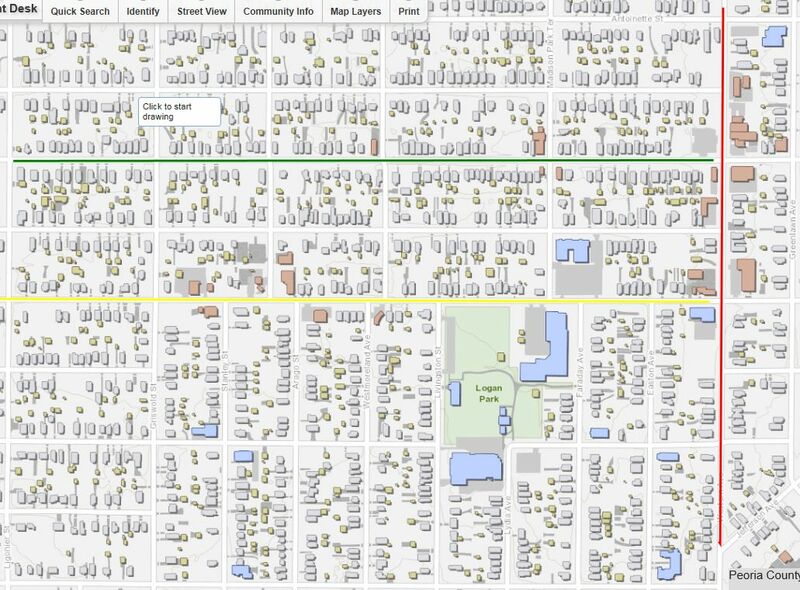 In yellow, Starr Street, a slightly larger vehicular route (but not a streetcar route) that provided through access to the neighborhood and is also marked with many commercial buildings. Red corner businesses along the green Garden Street former streetcar line. By comparison, here's a neighborhood in Central Peoria, just south of War Memorial Drive (the neighborhood is called “North Florence” and sits just southeast of War Memorial and Sheridan). This is a post-war suburb, and you can see that there's barely any commercial activity – on the northwest is a tiny, hard-to-access strip mall with a cellular store and a dry cleaner; on the southeast is a former drive-through bank that's now a State Farm Insurance (Randy Begole, good dude), that's also inaccessible from the neighborhood. There are a handful of religious buildings, all surrounded by seas of parking. (Top left: Disused synagogue that has had several failed redevelopment attempts. Below that, Apostolic Christian Church. Top center: St. Paul's Episcopal Cathedral. Top right, First Covenant, a small evangelical church.) 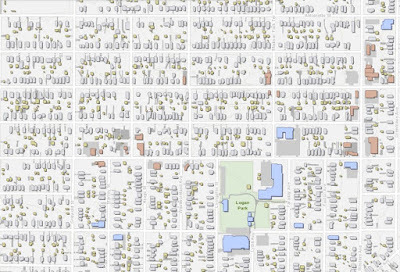 It's a very pleasant neighborhood for walking – you see lots of people out walking dogs or walking for fitness -- but there's not anywhere to walk to. This is typical of neighborhoods developed after zoning codes were introduced, separating commercial uses from residential and removing small-scale neighborhood commerce like ice cream shops and corner groceries. Postwar neighborhood of North Florence, zoned residential. There are no commercial establishments to walk to. 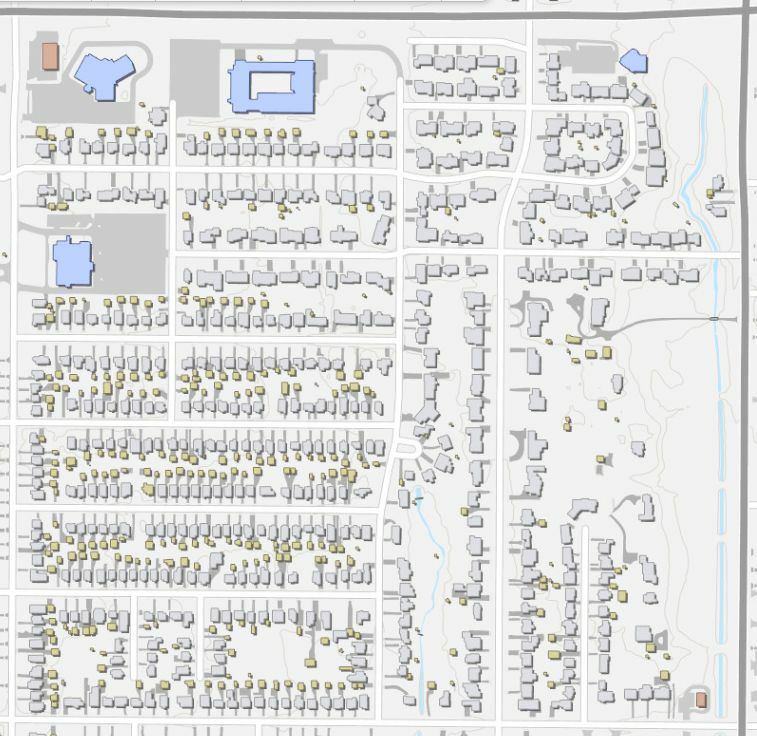 Here's a neighborhood in North Peoria (still within the City of Peoria), a fancy and exclusive neighborhood with large, expensive houses on sprawling lots, that is exclusively for cars. 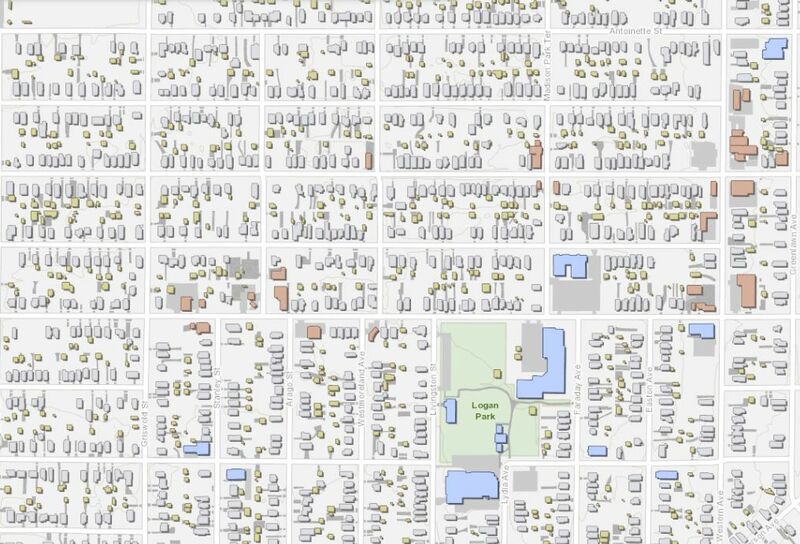 Here, the street grid has been abandoned, and many of the streets don't even have sidewalks. It's difficult to walk within the neighborhood, which is designed for cars rather than people. There is no commercial development at all within the neighborhood – the few red buildings face a busy arterial road (Knoxville) and cannot be accessed from the neighborhood. You must get in the car and drive to them (you cannot safely walk around; there's no shoulder and no sidewalk on that part of Knoxville). There are a lot of children in this part of town, but they can't walk to each others' houses, because the high-speed car-oriented sidewalk-lacking roads are too dangerous for kids on foot. (Even worse, restrictive covenants make all the front yards super-boring and the streets are hot and unshaded.) 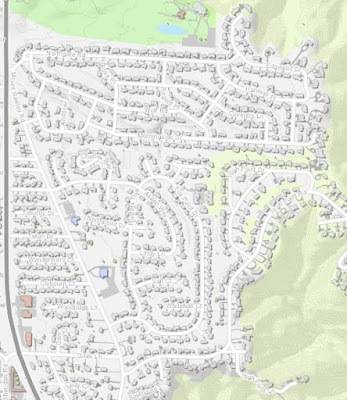 It's kind-of a hellscape, which is why you rarely see people outdoors in this neighborhood; they stay inside their pleasant houses or drive their cars even within the neighborhood itself. There's nothing to do in this neighborhood; there's no there there. 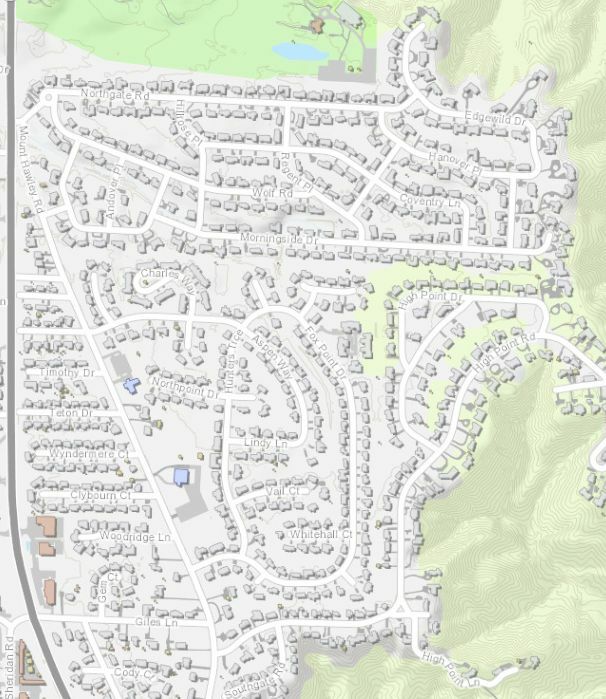 North Peoria neighborhood: no grid, not safe on foot, nowhere to go.